I dab globs of yellow, red and crimson on palette. Put music on. Put blindfold on. Stop, breath deeply and begin. 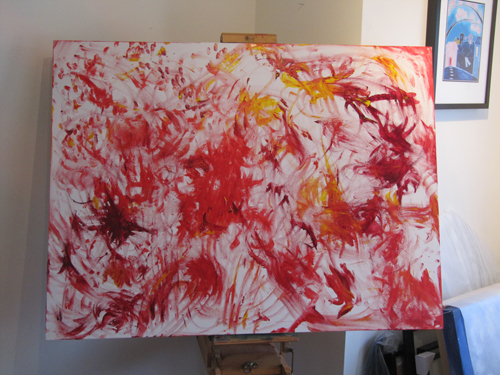 I dip hands in cool wet paint and begin to execute the objective of step one: just cover the canvas with paint. I don’t know what colours I am smearing, what mess I am making but I am a pre-schooler riding purely on joy. Dancing, wiping, dipping, spreading, turning… this step feels like flying. It always feels like flying before you think, before you become attached to painting something “good”. 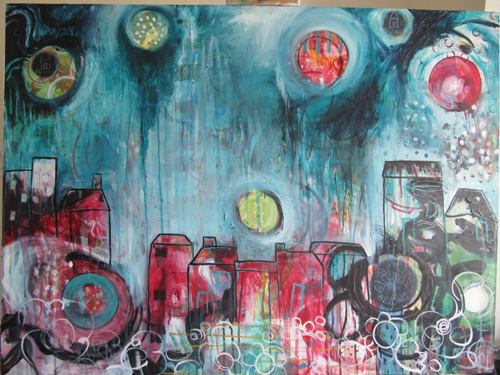 Once canvas is dry, layer on cool colours. Variety is the spice of life. I drag paint randomly across canvas. I dip sponge, dip brush in blue, make picket fence lines, dab lid of mason jar in Payne’s grey, make circles, skip them like a sonnet around the canvas. Fly all over with green, dab white, make snow. Dip pen cap in blue. Infinite and endless, I stamp circles on top of red or along canvas that lay unmarked, untampered. Step two is where impulse was hiding. It said make circles with brush, grab skewer, etch out a house, write the words home, it said etch love, etch belong. There is pure, raw power in spontaneity, in being fully present to impulse. If a soul can go every direction in the universe at once, it does so in stage two. I don’t usually paint with black and white. Instructions: paint with black and white. Skinny lines, thin brush, fat sponge, dab, drip, spray, splay, paint, run white right up to black. Squint eyes, see contrast. I see mess. I see a mess of colour and pattern and a noise that I may not recover from. 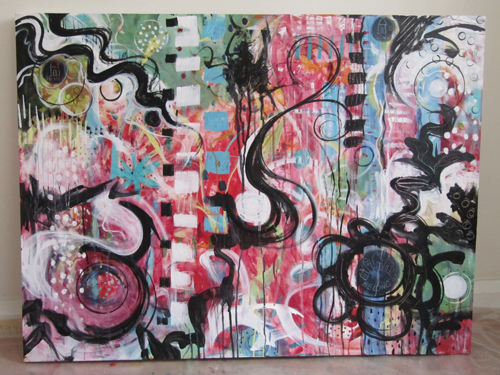 Add translucent paint… smear fluid acrylics on canvas with thumb, see how magenta changes the white, deepens the black. Spray water, let it drip. 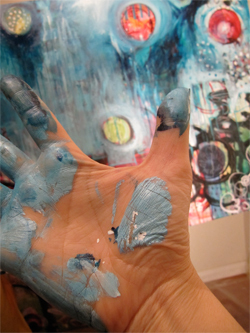 Wipe off, deepen, add turquoise, watch as depth is created like magic on the canvas. Put in images. I have a vision of lanterns. I draw them in with houses over complete mess of ugly colours yelling at me on the canvas. “You shouldn’t have been so wild” it says, “you should have mapped it out” head chides. I remind myself to trust. So much of painting is trusting. Just keep going, be present with every emotion but just keep going. Work with what’s working. I am stuck now for at least three days. 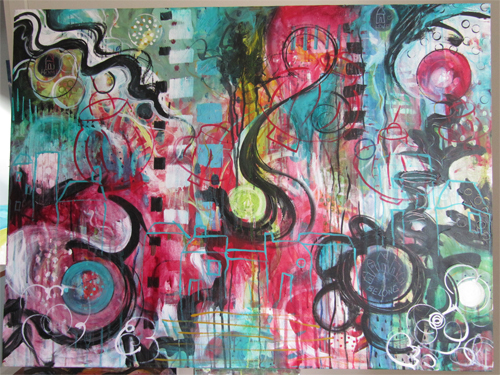 A jumbled mess on canvas, the glory days of step one and two are gone and I have backed myself into a painting I cannot seem to climb out of. 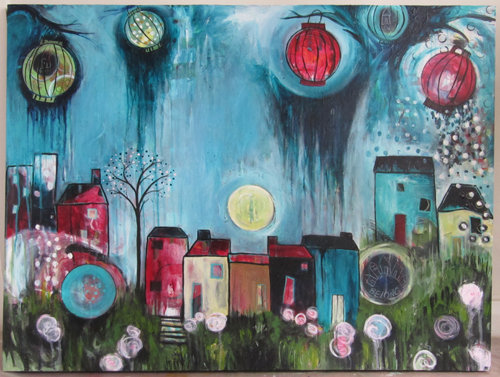 I stare at lanterns, at houses, at circles for days, painfully stuck, unable to figure out what to do next. Until I finally get angry. Being stuck and doing nothing is more painful than moving forward in ANY direction, so finally I just get mad. I grab fistfuls of teal, handfuls of white and Payne’s grey and I cover everything that I don’t like. Painting moves. I move out of fear, finally unstuck (sigh). Shape. I highlight things I like. Take careful steps as I navigate out of the ugly teenage stage to shape this awkward painting into hopefully a beautiful man or powerful woman. I accentuate snowy raindrops. 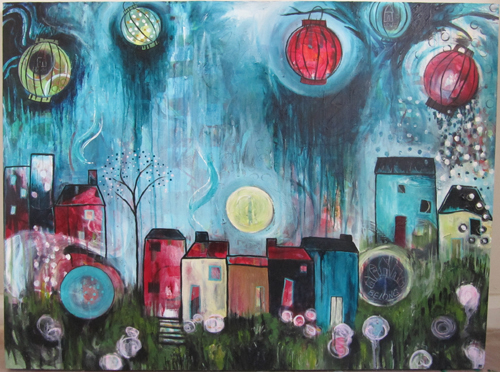 I turn the yogurt container circles into lanterns, fill houses in with texture, leave under-laying dabs and drips to reveal the underbelly or understory or under-struggle of the painting. I sculpt, I hone, I bring areas I like to life. I squint, I choose a colour scheme, I outline lanterns and I listen step by step scanning the painting until I like it all. Until it stops telling me what to do. Until everything just sits quietly, breathing softly in the corner. The mark of a good painting is the journey we take in painting it. The mark of a good life is the journey we take in living it. Thank you Shelly! It is so nice to know we aren’t alone in the emotional roller coaster of creativity, isn’t it. I do confess that a small part of me was worried about posting this, thinking “Do I appear crazy here?” but the more I learn to trust creativity, the more I realize what an emotional and sometimes very irrational journey it is. THANK you for your validation back! What a great write up ,,,interesting to see my own emotional roller coaster while painting, You finished with a beautiful painting, by the way how was Bali? This was briliant. Loved reading the process, and what a finale – a beautiful painting. Thank you so much Teresa. That is so nice to hear from a lovely painter like you! Natalie, thank you for sharing your journey, your emotions, your struggles and your triumph so eloquently. I am dying to do Flora’s class and reading your post makes me wan to even more. I adored this post!! I’ve never been to your blog before, but I can tell you that I will be back to read over more of your posts and to get to know you better. I love your painting… but even MORE, I love how you shared the process both on canvas and in your heart as you created this piece. Thank you so much for sharing with us!!! I found your work on Magically Mixed Media (FB) and I just wrote a similar post — but I’m thinking I need to take Flora’s next e-course! I have a stuck painting on my easel today. 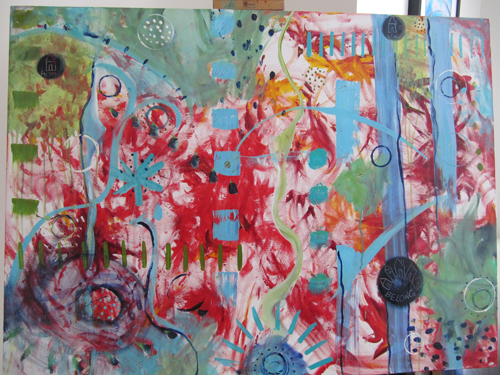 Your piece and your description of your process are wonderful! Thank you for this post! I am inspired. Love your description of the painting process. I was also in Flora’s class in the spring. Loved it! Almost forgot: I love the end result! It’s beautiful, dreamy and playful! Great work! Thank you for sharing the process; vulnerability and courage hand in hand. Inspiring. Gives me permission and maybe one day I will have the courage too. I think it is amazing you didn’t want to let go of the circles and words like home, belong, love…and the end result evokes those very thoughts and emotions along with warmth and protection. Thank you so much for sharing your process. So beautiful Nathalie! First of loll, I love your painting. Everything about it spells warmth and truth and joy. I don’t think anyone who hasn’t experienced those emotions can truly appreciate the joyously agonizing ride an artist takes to birth a painting. No wonder we get attached. Creating it was much like carrying a child! Nathalie your journey, your painting and your wisdom inspire and give hope for all of our journeys and our lives. What beauty you create! I have learned something new Nathalie – very interesting. I had no idea how some of your creations come about. Looks like it requires a lot of patience…and paint! All the best, and then some. 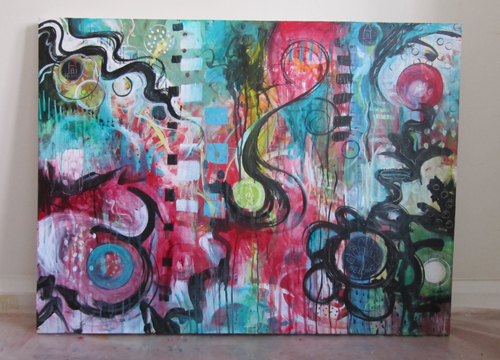 This was a thrill to see in person at the Beach Studio tour, and to read again your process in making this piece. What a journey!